Nuno Espirito Santo's side put their mid-week woes behind them with a comfortable 2-0 win over Cardiff City with goals from Diogo Jota and Raul Jimenez. The victory resumed usual service for Santo's side after Wednesday's wobble at Huddersfield, moving them three points clear of Watford in seventh as they battle to be the best of the rest (outside the big six) this season. For Cardiff it's more away day misery as Neil Warnock's side have just eight points from their 14 away games this season, leaving them in 18th and two points off safety with nine games left. Despite the result, it was, in fact, the away side who starting the brighter of the two teams, and they came close to opening the scoring five minutes in. Arron Gunnarrson latched onto a cross into the box and unleashed a fierce effort which was well saved by stand-in goalkeeper, John Ruddy. Ruddy's save would prove to be an important one for his side as they opened the scoring at the other end ten minutes later. Jimenez showed superb vision to find Jota in the box, who controlled well and neatly slotted home to the hosts an early lead. The opening goal seemed to fire some life into Santo's side as they had their second two minutes later, again through the Jimenez-Jota combination. This time Jota proved provider, as he set up Jimenez 12 yards from goal, and the Mexican made no mistake with his finish, hammering past Neil Etheridge to double his side's advantage. Wolves continued to knock on the Cardiff goal and they nearly had their third ten minutes before half time. The ball fell to Leander Dendoncker who crashed an effort against the post, he then again latched onto to rebound but was again denied, this time by average to deny the Belgian his second league goal of the season. In a dominant early 45 minutes, the hosts deservedly went in at the break two to the good. The second 45 minutes starting in a similar fashion to the majority of the first half, with Wolves on the front foot. Five minutes after the restart Adama Traore looked to mark his return to the side, but fired an effort from distance just wide of the mark. With Warnock's side in a real relegation fight, the Cardiff boss would have been disappointed with his side's showing, as 'fight' is one thing they seemed to lack. Joe Ralls' effort 20 minutes from time seemed to sum up his side's performance as he fired an effort from distance high, wide and not very handsome. Despite their lackluster showing, Cardiff did seem to find some fight in the final proceedings of the game as Joe Bennett and Sean Morrison both had chances to get their team back into the game. First Bennett found space inside the Wolves penalty area, but elected to pass instead of shoot, which was well cut out by his name sake Ryan Bennett. 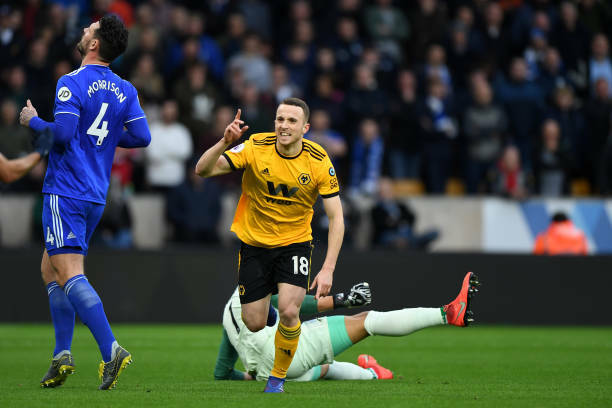 Morrison then had an even better chance to send late worry into the minds of the Wolves camp as he peeled away from his man to connect with a Ralls corner, however, he wasted his opportunity and headed straight at Ruddy. The away side's last ditched efforts proved to little to late as Wolves held on to record their twelfth league win of the season. After a dire performance in West Yorkshire on Wednesday evening, Santo's team reacted in superb fashion as they were back to their free-flowing best that we have been so used to seeing in the Premier League this season. The defeat means the Bluebirds remain in the dreaded relegation zone, two points off Southampton who sit safe in 17th, and if it wasn't for the late strike at Old Trafford to give Manchester United a 3-2 win over the Saints, it could have been a lot worse for Warnock's men. Santo's change in tactics to move Jota further forward as a partnering striker for Jimenez seemed to work wonders for his side, as the pair combined for both goals setting each other up. There is no doubt that Wolves will now have this effective front partnership for the remainder of the season.